Truth be told, I did want to first discuss those other mods I did to my car before the SSCT track day on the 23rd at Fuji Speedway as I had mentioned in my entry for December 12. But as it turned out, not only did my friend Dino accompany me and agree to take some video of me flying by on the long straight, but Adam from FEAST Auto Group was also at Fuji and took some photos and was kind enough to allow me to use them for this blog. Thanks guys - this stuff is too good NOT to publish first - so the post on the other mods will have to wait! 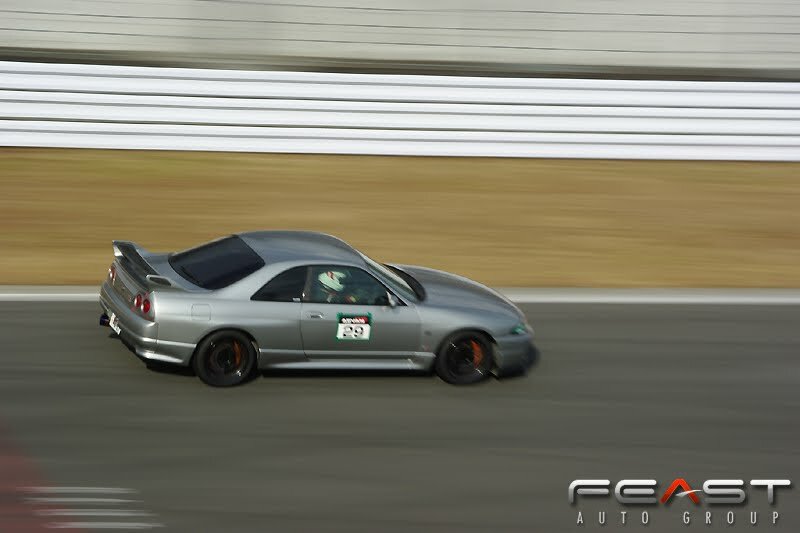 This time, both Thomas (purple R33 GT-R - his blog) and Terrance (white R33 GT-R who ran with me at Tsukuba in September) decided to run in this track day. 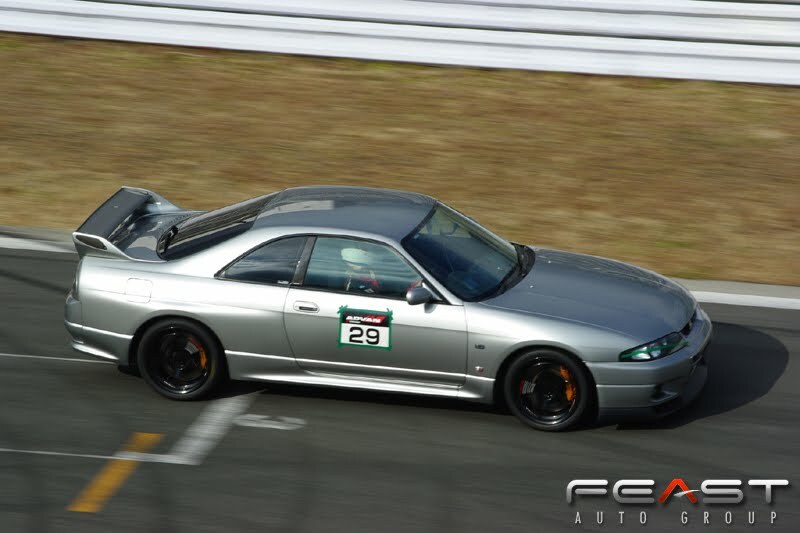 So we convoyed to Fuji and arrived a bit past 0800, checked in and proceeded to get our cars ready for the run. Here is how we looked, ready to go. 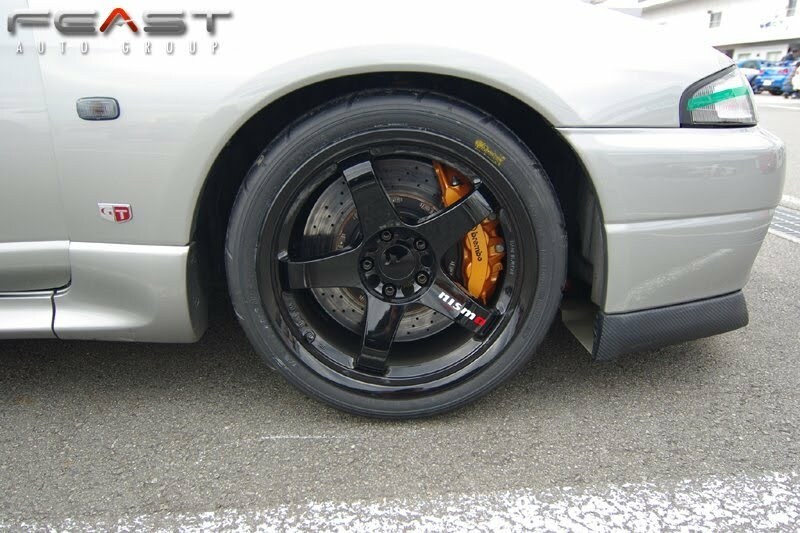 Oh, you may notice one "mod" here - I was one of the lucky few to be able to order, and purchase new, these limited edition Nismo LMGT4 rims. Of course, me being me, before I put them on I spent some time in my garage apply some glass coating. This worked great on my stock 17inch rims, which to this day I can blast with water and the dust just rinses off. 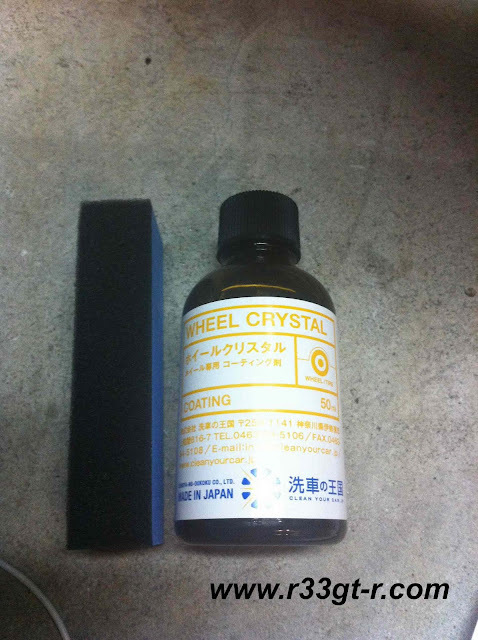 But on black wheels, I have to say I am not sure about its effectiveness - first because black actually doesn't show the dust as badly as a silver wheel, and also because, in its application, I found that it's very easy to leave minute scratches in the gloss black. But, in the end, it was worth it - and here is a close up of the front wheel and the R35 caliper and rotor. On this day, SSCT had blocked off two full hours - one at 1100, and the other at 1300. However, I chose to run only 30 minutes at a time, for a total of one hour. In retrospect, I probably should have taken advantage and run the full 2 hours, but I was worried about putting too much stress on my car. In part, I was worried about how the new brakes would hold up - but that turned out to be NO PROBLEM at all, I ended up being able to easily slow down for the first corner with no fade, every single lap. Best mod ever? Temperatures were cold that day, I believe the track surface was about 2 or 3 degrees C, and it took a while for the tires to warm up. But I was fiddling with a few new items - one the DigSpice GPS track data recorder, and also the new iPhone app called "Harry's LapTimer" which allows video recording (of every other lap) plus GPS data plotting. I also had on board my trusty old Panasonic video camera, as well as the LapShot laptimer device. Needless to say, my first 30 minute stint I was more concerned about getting all of these working properly than setting my best time! In the end, I discovered I had gotten the DigSpice and LapShot to work, but not the iPhone app the first time out. And second time out, I got all three to work, but the iPhone holder failed, resulting in video taken at various weird angles. Howver, I plan to have the data and video from the above items processed soon, and will post an entry with these materials soon. Finally - here is video of me (third car) flying by on the Fuji straight. I was probably still accelerating on my way to about 260kph - not as much boost that day - about 1.2 I think - meant a lower top speed. Enjoy! 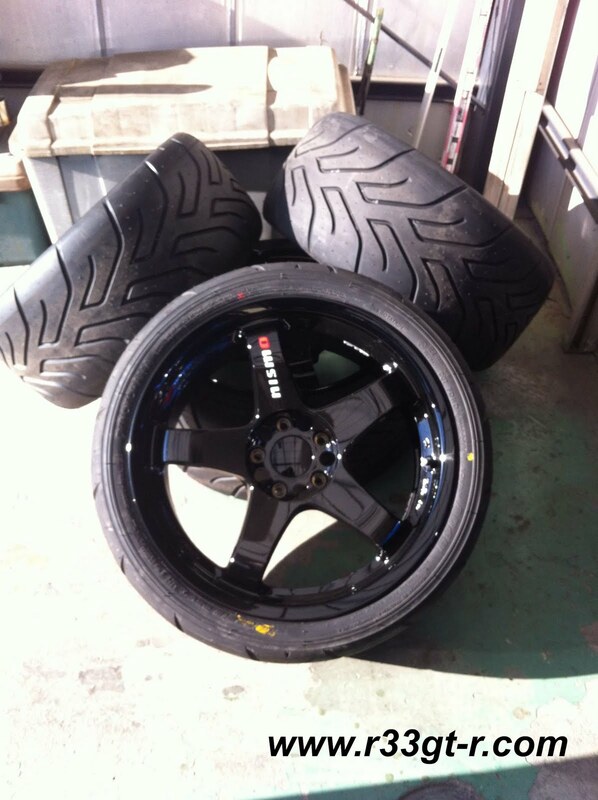 You car looks and sounds superb Aki :) Also, congratulations on the wheels!